Personalized classic sunglasses – green can be favored for gifting by advertisers who are eyeing green and prosperous benefits in summers. This super cool sunglass can be easily identified due to its features such as plasticized frames, green colored arms, and darker UV protected lens. 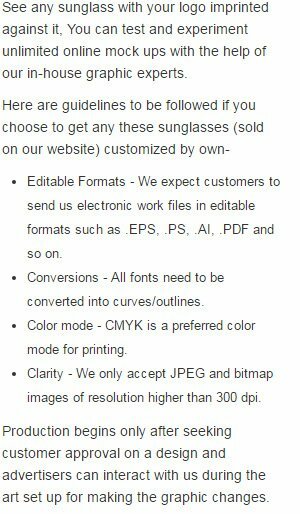 Promotional classic sunglasses – green are largely sought as a symbol of sophistication by green businesses, boutiques, fashion houses, cosmetic suppliers, restaurants, pizzerias, theme parks, fantasy parks, arboretums, botanical gardens, etc. Custom classic sunglasses – green can be gifted as a part of summer promotions or during some shopping events, celebratory occasions, family functions, or shopping events. This sunglass is cost-friendly, which makes them an even choice for bulk gifting. Imprint Area: 1 1/2" X 3/8".